PMBComment | Last week, the New York based Human Rights Foundation (HRF) released a comprehensive report on the political crisis that rocked Honduras when its democratically elected President was forcefully expatriated by the military as retort for his increasingly undemocratic tendencies and unconstitutional activities. Much has been written about the role the Organization of America States (OAS) played in the aftermath of President Mel Zelaya’s forced removal. Most observers have concluded that this was not the OAS’s finest hour. We have detected remorse and doubts from various officials from key member states. The fact remains that Honduras has not yet achieved global recognition for its new, democratically elected, government, nor has it rejoined an OAS that has willfully ignored the systematic democratic and human rights transgressions of other member states. Now, the General Counsel of the HRF has isolated and summarized the role of OAS Secretary General Insulza in the crisis. Interestingly, he sheds new light on the critically important period that preceded the ouster of the hatted Mr. Zelaya. HRF’s legal report contends that if Secretary General Insulza had acted in adherence to his obligations, all anti-democratic events that led to the interruption of democracy in Honduras could have been avoided. It is reasonable to assume that if Insulza—instead of encouraging and endorsing a poll that went against multiple court orders—had refrained from rendering legitimacy to President Zelaya’s anti-democratic actions, the OAS could have deterred the June 28 coup d’état and the unconstitutional removal of the president by Congress, as well as the Supreme Court validation of these anti-democratic events later. Sadly, however, throughout the Honduran crisis, Insulza acted as a mere international agent of President Zelaya, rather than as the leader of an international organization called to promote and protect democracy in its member state. Note | As I count myself among those who opposed Insulza’s original election and now oppose his reelection, I will post, for the record, in the next few days, my personal “10 Top Reasons Why Insulza Should Not Be Reelected”. Suffice to say that the handling of Honduras, where I agree wholeheartedly with the conclusion of the HRF, takes the #1 spot ahead even of #2, his reckless, and futile, campaign to have Cuba readmitted into the Inter American system without conditions ,and #3, his very weak and unprincipled handling of Hugo Chavez’s abuses at home and his meddling in the region. o The Human Rights Foundation’s legal report reveals that there were informal talks between President Zelaya’s administration and the OAS General Secretariat, discussing what sort of mission the OAS could send to observe President Zelaya’s “opinion poll” and report back to the OAS. By the time this informal discussion took place, the Attorney General and Congress had been publicly expressing outrage over President Zelaya’s consultation/poll for over two months. By June 3, the Administrative Court of Tegucigalpa had issued three highly publicized court orders (two preliminary injunctions and a court notice) enjoining President Zelaya from carrying out the poll. o The June 26 misleading statement by Insulza’s representative was made after the U.S. Permanent Representative at the OAS requested the Secretary General to “clarify” what his role had been in Honduras. Specifically, this request followed a Permanent Council discussion about the June 23 resolution by the Honduran Congress, expressing “profound outrage” and requesting the OAS to “immediately withdraw” its Accompaniment Mission. The resolution was delivered through a letter to the OAS, and was formally received on June 25.
o On July 13 and 14, the Adjunct Secretary General of the OAS, Albert Randim falsely told a U.S. Congress body (the Congressional Hispanic Caucus, consisting of 24 congressmen) that “before the coup d’état” the OAS “had a proactive role” in seeking to “prevent the growing confrontation” between the “government and the opposition” and in “supporting a pacific settlement of the dispute.” He did not mention anything about the Mission of Accompaniment or the “outrage” letter by Congress that ensued. o On June 28, after the military expatriated President Zelaya but before Congress met, the president of the Supreme Court (who was in a meeting with the presidents of Congress and the Electoral Tribunal) called Insulza on the phone to tell him he was “examining” the way to restore the constitutional order. HRF’s legal report contends that, at this point, Insulza—without justifying or condoning the coup—should have recognized President Zelaya’s repeated anti-democratic actions and offered his good offices to: (1) gain as much support from the international community for the Supreme Court, so that they could duly declare the coup d’état void and unconstitutional; and (2) gain support from the international community for the Supreme Court, so that any criminal proceedings against President Zelaya, and his eventual suspension or removal from office as a result of a presidential trial, would be carried out according to the Honduran constitution and with full international support. 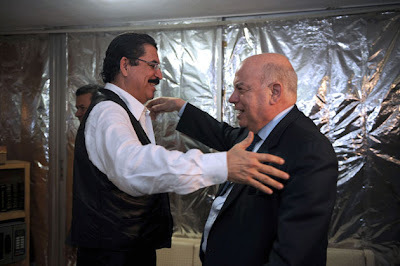 o But no, Insulza circumvented the issue of President Zelaya’s anti-democratic actions and the possibility of an internationally-endorsed trial against him. Throughout his phone conversation with the president of the Honduran Supreme Court, Insulza acted as if he did not know about the multiple court orders against President Zelaya’s poll, and about how the OAS’s Accompaniment Mission had contributed to the escalation of the crisis. Hours later, Micheletti was sworn in by Congress and two days later the Supreme Court validated the coup, by issuing a set of documents including “secret search and arrest warrants” that, nevertheless, failed to provide for President Zelaya’s expatriation to Costa Rica, or for his suspension or removal from office as a result of the proceedings. o It is true that reverting the anti-democratic events in Honduras became far more difficult after June 30—when the Supreme Court validated the coup by the armed forces and the unconstitutional removal by Congress. However, the OAS should have tried to achieve this goal by performing good offices precisely with the former president of Congress, with the current Congress, and, especially, with the Supreme Court. Nevertheless, the Secretary General wrongfully interpreted the July 1 General Assembly resolution as a prohibition to perform good offices before the democratically-elected Congress and the Supreme Court, including them in what he broadly called “the de facto regime.” On the contrary, both the Secretary General and, later, the General Assembly treated President Zelaya at all times as an exemplary democratic leader. Considering this biased approach by OAS officials and organs throughout the crisis up to July 4, all diplomatic initiatives between June 28 and July 4 were expectedly fruitless in reverting any of the anti-democratic events in Honduras. Instead, they likely caused most Honduran institutions affected by President Zelaya’s previous actions to become further entrenched in their positions. As a result, the General Assembly applied the ultimatum and suspended Honduras from the OAS. o Unlike the actions taken by the OAS throughout the crisis, the diplomatic initiatives carried out by the president of Costa Rica since mid-July were appropriate as they were aimed at reverting the three—and not just one—anti-democratic events in Honduras, without ruling out the possibility to carry out a presidential criminal trial against President Zelaya. Specifically, the San José Accord proposal called on President Zelaya to refrain himself from “calling for a constituent assembly, in a direct or indirect way;” and called for the “return of the branches of government, to their composition before June 28.” It specifically called on Congress to reinstate President Zelaya “until the conclusion of his term, on January 27, 2010,” but did not rule out the possibility of criminally trying President Zelaya for the crime of abuse of authority, upon the completion of his term in January 2010. Unlike the position adopted by the OAS Secretary General, the San José Accord also called on all parties involved in the crisis to sit around the negotiation table and the president of Costa Rica explicitly offered his good offices before the democratically-elected Congress and the new chief of the executive, Roberto Micheletti—who had from the outset been recognized as president by the Congress and the Supreme Court. In the following weeks, many member states and the General Secretariat of the OAS aligned themselves with this new diplomatic approach by President Arias. On August 8, OAS envoys traveled to Honduras exclusively to meet with Micheletti. o According to a 2003 study prepared by a group of experts on collective protection of democracy (edited by Madeleine Albright), under the auspices of the Council on Foreign Relations, when the restoration of democracy can not be achieved through reverting the anti-democratic events that caused the breakdown of democracy, the international community must get the anti-democratic regime to agree to hold democratic elections in the shortest timeframe possible, and to allow the international community to monitor them. Accordingly, the OAS should have decidedly promoted and monitored the elections of November 29 in order to foster the restoration of democracy in that country. However, in early November, the Secretary General of the OAS publicly stated that a team of OAS observers for the upcoming elections of November 29 “is truly something we could not even consider.” This is the same Secretary General that five months earlier, in spite of the lack of any international legal provision allowing for this type of mission, and against a formal request by the Honduran Congress to withdraw it, did not hesitate in putting together an unprecedented “Accompaniment Mission of the OAS” that would “observe an opinion poll” that, “if victorious,” would have led to the election of a Constituent Assembly on November 29.
o HRF’s legal report contends that if Secretary General Insulza had acted in adherence to his obligations, all anti-democratic events that led to the interruption of democracy in Honduras could have been avoided. It is reasonable to assume that if Insulza—instead of encouraging and endorsing a poll that went against multiple court orders—had refrained from rendering legitimacy to President Zelaya’s anti-democratic actions, the OAS could have deterred the June 28 coup d’état and the unconstitutional removal of the president by Congress, as well as the Supreme Court validation of these anti-democratic events later. Sadly, however, throughout the Honduran crisis, Insulza acted as a mere international agent of President Zelaya, rather than as the leader of an international organization called to promote and protect democracy in its member states. Id., at 112, 123, 161-62 (HRF received the original copies of the June 8 and 16 letters on the week following the publication of its report). Id., at 111, 159, 170. Id., at footnote 218 (the quotes by Albert Randim are translated from the official Spanish versions of July 13 (C-227) and 14 (C-229) General Secretariat releases, because there are no English releases posted on the OAS official website where those two specific ones should be.). Id., at 127, 169, 172, 182-84. Id., at 139, 142, 151, 180-85. Id., at 106-07, 145-47, 181-87, 190. Id., at 107-09, 113-14, 147-48, 155, 163, 187, 191. Id., at 17, 166, 170-176, 179-191.